I thought I'd share these with you today. I was feeling bored and wanted something different to do, so I had a rummage amongst my stash and found some black shrink plastic. I stamped the design (the largest paisley one from the Perfect Paisley set) using a metallic silver inkpad. I then cut them out carefully, leaving enough to hang on to while the ink was wet, and punched a hole in the top using my cropodile. I then heated, using a pokey tool in the punched hole to stop them flying away, until they had stopped shrinking and then pressed them down with an acrylic block. The ink did not dry fully as I'd expected it to, so I added some crystal embossing powder and heating again. It's not easy to see in the picture but it does look like tiny encrusted jewels. Please excuse my wonky loops, I don't have proper round nosed jewellery pliers and its not easy to do with regular pliers!! 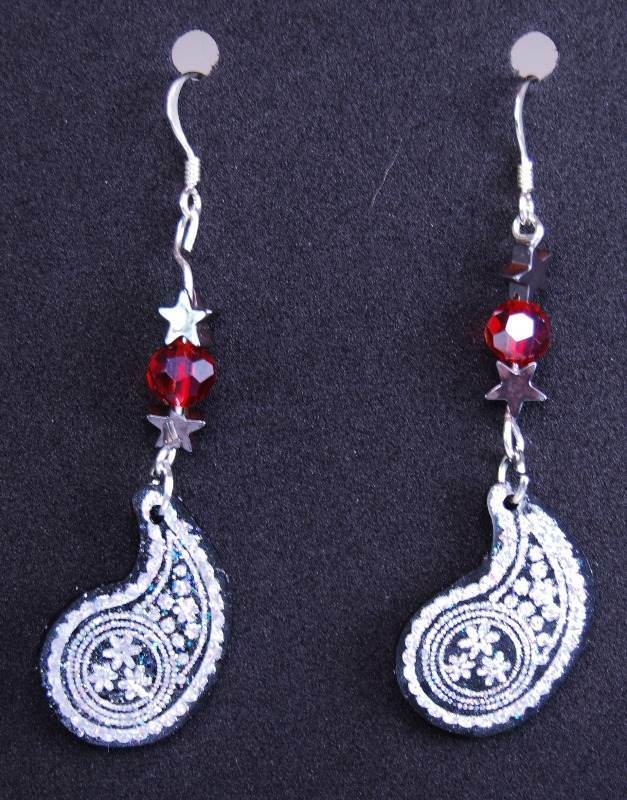 These paisley shapes lend themselves really well to jewellery and little charms I think. Tomorrow I might have a go with some of the other designs, I'm thinking Flutterby and Fun Flowers in particular might make good jewellery too.